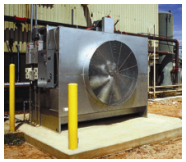 Cooling Towers - R-Cap Process Equipment, Inc.
Standard sizes range from 140 to 6,285 gallons with pump sizes from 1.5 to 100 hp. Flow rates can be adjusted on each pump tank, depending on the customer’s needs. Standard with stainless steel reservoir and diamond-plate pump deck. These towers have an induced-draft counter flow design which offers superior construction with horizontal seams assuring leak-free operation, reduced operating costs, long life and easy installation. Available in 50 to 200 tons. These towers are an energy-efficient induced-draft cross flow design which is pre-assembled, and feature galvanized components and PVC fill for corrosion protection. Available in sizes 10 tons up to 175 tons. These towers feature high-efficiency water distribution across both sections as well as galvanized walls for corrosion protection, with stainless steel cooling tower construction available. Sizes range from 135 tons to 600+ tons per cell.